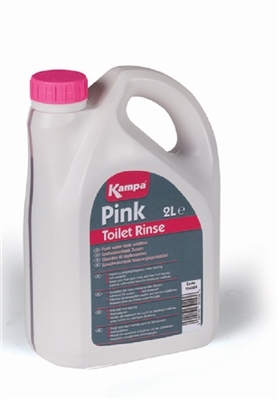 Kampa Pink Toilet Rinse is ideal for use in portable lavatories or caravanning. Kampa toilet rinse provides antibacterial protection, helping to keep your flush tank free from harmful bacteria without the need for additional additives. To use, simply add 75ml of Kampa pink toilet rinse directly to your flush tank, the toilet rinse will also release a delightful fragrance every time the toilet is flushed. PLEASE NOTE THAT WE CANNOT SHIP LIQUIDS TO DESTINATIONS REACHED BY PLANE - THESE ARE GENERALLY DESTINATIONS OUTSIDE OF THE UK AND MAINLAND EUROPE. IF YOU ORDER THIS PRODUCT FROM ONE OF THE DESTINATIONS WE CANNOT SHIP TO WE WILL HAVE TO CANCEL AND REFUND THIS ITEM FROM YOUR ORDER.